Here’s the story behind these adorable little morsels! I had dinner with my friends from PAWS (Pet Animal Welfare Society) last night. The conversation always turns to animals, and we all share our stories in one way or another. At dessert time, my friend Alexis presented a tray of adorable edible mice. They were actually quite simple in design: a chocolate-covered cherry (with stem) for the body and tail, a Hershey’s Hugs Kiss for the face, sliced almonds for the ears, and icing for the eyes and nose. 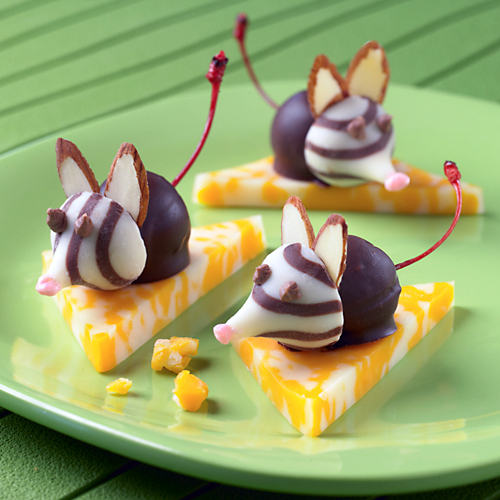 Serve them over a triangle of cheese… genius! Or should I say “Micey” Nice! Love it! I’m going to attempt bunnies for Easter too. Using white chocolate and coconut flakes for fur! I’ll post a pic if they turn out! Thanks for the idea. Oh! My MIL made these at xmas time. I think I included a photo of them in my Xmas article on my blog. Can’t remember but your photo is way better! i absolutely love this idea. so cute! would make a great party favor at any kind of party really! I never saw anything so cute. I have made alot of cute appetizers in my day, but I never would have thought of that. I will have to try it! These are adorable! So cute and creative :). Oh my goodness, I’m about to die from cuteness! These are adorable. I think these would be perfect for a kid’s tea party! So glad you shared this. Thanks Marie. I am a big fan of your blog since you are such an excellent writer with original ideas. We have a bread recipe coming very soon that you’re going to like! Thanks Lauren. These mice are quite popular in cyberspace! Those mice look so cute. I love the cherry idea. Hi charlie, let us know if you make them….and take a picture! So cool that you are experimenting with Julia Child’s cookbooks. I did the same thing when I was 12, only I started with crepes. Tres bien! Thanks Jenna….and they taste good too! Just saw these on Foodgawker and had to stop by to say how cute they are. WOW – great looking plate! I’m impressed! !